Kivi is a small child with a strong will. All Kivi wants for the upcoming birthday is a dog. And one morning there is a dog waiting outside the bedroom door. But it is not the kind of dog that was expected … A hilarious story that changed the Swedish language and the way we look at gender. Do not miss the sequel KIVI AND THE CRYING GORAFFE. 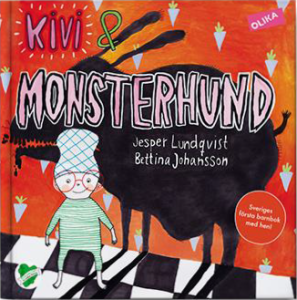 The first children’s book in which the Swedish gender neutral pronoun hen is used instead of he/she. Until 2012 there was no established way to talk about a person without referring to the gender of that person. This also meant always bringing in stereotypes about women and men in the conversation. There was no way to avoid it. “Kivi and the Monster Dog” was the first children’s book to introduce “hen”: the third gender neutral pronoun in the Swedish language. In English the term “thee” is suggested as a gender neutral word (she/he/thee). This entry was posted in Picture Books and tagged OLIKA Förlag on September 28, 2015 by sbarrouillet.